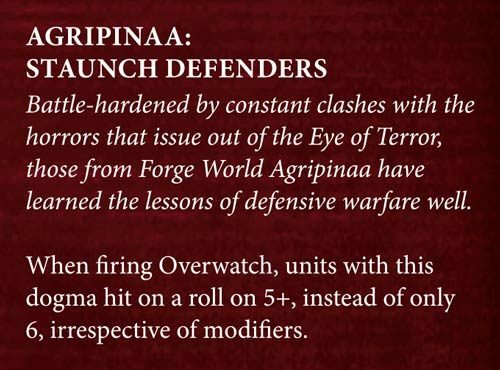 And today Warhammer Community presents us with Agripinaa, the forge world closest to Cadia! Apparently Agripinaa is the forge world with the most Servitors, so...they shall serve. 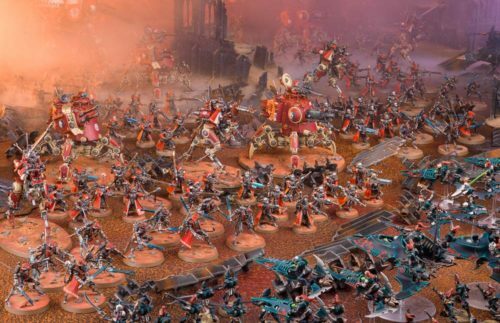 It's a great army if you want to build a very Servitor-focused army. 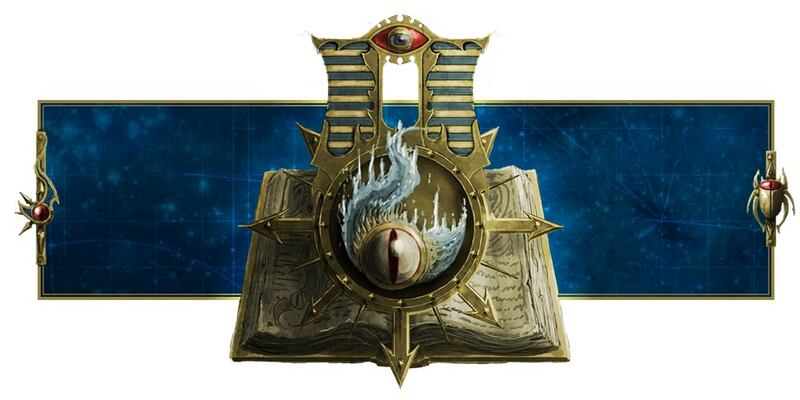 Not only that, they have a very cool forge world dogma that basically grants all units Cognis. Oh yeah, Cognis is back, guys! And it's not limited to those cognis flamers or cognis heavy stubbers or autocannons or lascannons. Every single shooting weapon gets it if the wielder is from Agripinaa. Wow! That's a great dogma! This is going to be fun for your Kataphron Destroyers and Kataphron Breachers because they will be dishing out Overwatch on 5+ with their high volume of shots! 3 Kataphron Destroyers fire 3D6 attacks with plasma culverins and 15 shots with their heavy grav cannons, so load them up with the right weapon and see them rip and tear charging enemies apart! Oh, amd that's not all. Agripinaa has several cool Stratagems for their Servitors, especially their Kataphron Battle-Servitors. Yeah. So if you have one Kataphron Destroyer left who fell back or something, you can spend 1 Command Point and transport them somewhere else in your deployment zone at full starting strength. 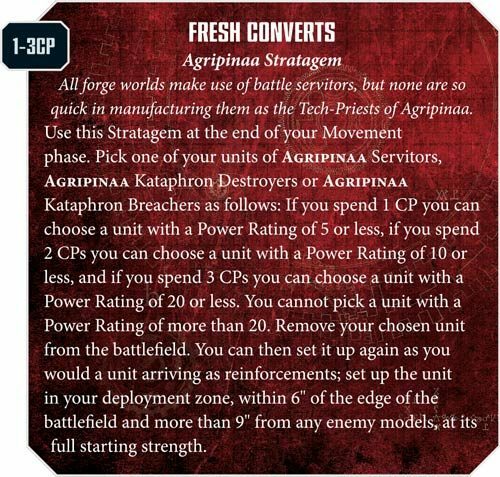 In other words, you're spending 2 Command Points to revive a nearly dead unit (resurrecting 2 Kataphron Destroyers and potentially 8 if you brought that many and put them in the same unit, but that costs 3 Command Points). 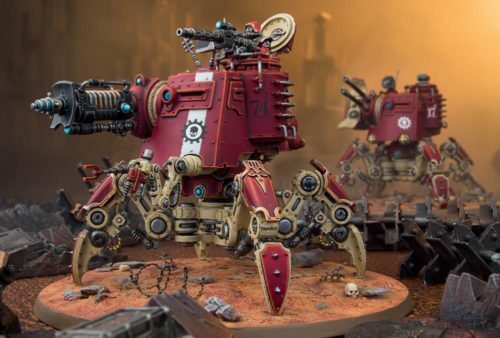 Another unit that benefits from Agripinaa's forge world dogma is the Onager Dunecrawler with Icarus array. You're firing 10 shots in Overwath at 5+. That's gonna hurt. Oh, and don't forget the Kastelan Robots with 3 hheavy phosphor blasters and 9 shots each. Now, that is crazy. Put them on Protector Protocol and they will be firing 18 shots in Overwatch each at 5+. Whoa, that's insane. Nobody will want to charge your heavy dakka Kastelan Robots, ever. If you make them Agripinaa, I mean. The Adeptus Mechanicus codex will be available for pre-order tomorrow, so I'll be checking out the limited edition and making a decision whether to buy it, or if I should just buy the normal one from my local gaming store (Dreamers Vault). Whatever the case, I'll definitely get the datacards for Adeptus Mechanicus and Open War cards. Oh, and I don't know if they're going to preview the last two remaining forge worlds tomorrow and Sunday - we still have Ryza and Stygies VIII left!